Dermatitis; Denial (Psychology); Biopsy; Blisters; Diagnosis. Dermatitis artefacta (DA) is an intentional self-inflicted dermatitis produced by patients for unconscious psychological gain. Characteristically, patients deny the responsibility for their creation. It is a poorly understood condition and, in most cases, goes on for a long period of time before a diagnosis is made. This condition creates a lot of anxiety for physicians due to a lack of awareness of the disorder and involves a considerable amount of time and resources to deal with. Suspicion usually arises when there is an unconvincing history of the evolution and recurrence of these lesions, their locations on the body, and their bizarre shapes. Here we report a typical case of DA in a 33-year-old male who repeatedly presented with oddly shaped recurrent skin lesions in the left lower leg for nine years. He had numerous doctors’ visits and tests, and was admitted to a number of different hospitals without reaching a diagnosis or a cure. Here we report a case of recurrent skin lesions typical of DA appearing in the left lower limb of a 33-year-old Omani male for nine years. Figure 1: Horseshoe-shaped superficial crusted lesions on the left lower leg of a 33-year-old male with three identical linear bullae above the knee joint. Figure 2: Close-up of superficial lesions in the left lower leg of a 33-year-old male showing different stages of healing with normal looking skin around them. 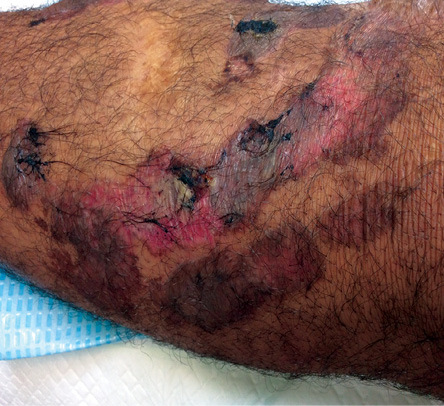 A 33-year-old Omani male presented with recurrent left leg lesions over a period of nine years. The patient gave precise timing of when the most recent skin eruptions started. First two lesions spontaneously erupted and then increased in number in the same area. He claimed to have fever, nausea, vomiting, fatigue, and dizziness. 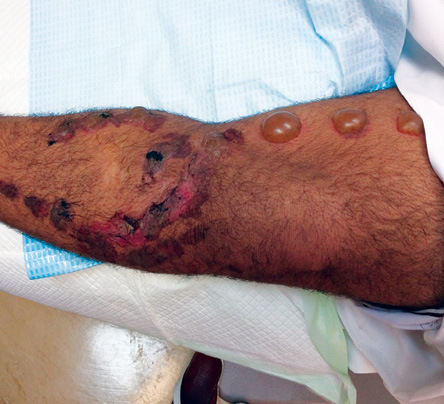 He was admitted to Sohar Hospital and treated for a skin infection with antibiotics. The lesions recovered completely after three days. Lesions then reappeared around the same area, repeatedly. He was treated and hospitalized because of this problem many times in different hospitals. According to the patient, biopsies taken from the lesions, as well as microbiological and biochemical tests, were all normal. His lesions apparently disappeared shortly after admission to the hospitals. The patient travelled abroad for the same problem and, once again, no definitive diagnosis was made despite the many tests performed. He was diagnosed with skin infection and treated with antibiotics and according to the patient there was a complete disappearance of the lesions. The latest episode of skin eruptions started to appear three weeks prior to his consultation with the infectious disease and dermatology clinics at Sultan Qaboos University Hospital. He gave a history of fever, nausea, vomiting, and fatigue most of the time. He also reported that it had been difficult for him to walk. On further questioning, the patient appeared to have knowledge of where the next lesions would appear. He pointed to a healthy area of the skin near the old lesions. He had been on sick leave for a considerable time and had not worked consistently for the last six months. Assessment showed no fever and other vital parameters were all normal. Examination of the left leg showed mild erythema with trivial swelling and superficial crusted linear erosions on the medial and lateral aspects forming a horseshoe shape below the knee. There were three well-demarcated, well-spaced identical linear bullae on erythematous bases above the knee joint on the medial side of the thigh [Figure 1]. The lesions on the knee joint and below were at different stages of healing [Figure 2]. Figure 3: Biopsy of blisters showing necrosis of epidermis and superficial dermis, magnification=40×. 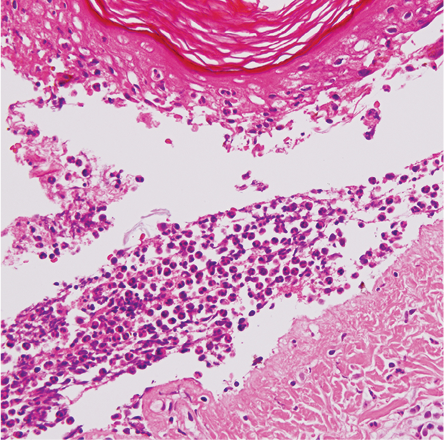 Figure 4: Biopsy of erosions showing necrosis of keratinocytes with evidence of healing by regeneration underneath, magnification=40×. The rest of the skin in-between the lesions and elsewhere in the body was completely normal. Examination of the rest of the body was unremarkable. Microbiological tests were ordered including blood cultures and lesion swab cultures, and serological tests for tuberculosis, retroviruses, chronic hepatitis, and other viruses. Biochemical tests were done including kidney and liver function tests and bone biochemistry tests. The results of these tests were normal. The findings from the erosions revealed a subcorneal cleft made up of necrotic keratinocytes covered by a thick orthokeratotic horny layer at the roof. 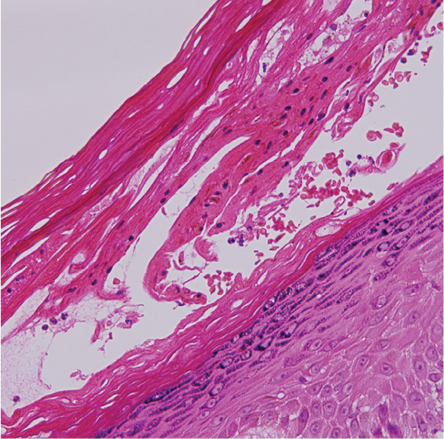 The dermis showed mild perivascular lymphocytes infiltrate [Figure 4]. The sections taken from the two sites show two evolving lesions including subepidermal blister with necrosis of epidermis at one site and healing lesion with evidence of transepidermal elimination at the other site. These blisters were due to necrosis of the epidermis and were negative for immunofluorescence. Hence, these findings were compatible with a diagnosis of artefactual condition. In our case, given the long history of recurrent lesions, their appearance, shape, and location in area of skin easily accessible to the patient, in addition to the pathological findings and normal tests, a diagnosis of DA was made. A psychiatric assessment was then sought for the patient. Box 1: Typical clinical findings and features of dematitis artefecta. Hollow history (meaningless medical history). Lesions located at sites accessible to patient. Foreign object source of lesion. Lesion e.g. blisters, superficial erosions, abrasions. Isolation and failure to communicate makes it difficult to help these patients.14 Psychiatric evaluation is essential as patients with DA often show signs of personality disorders, such as mood and anxiety disorders, depression, impulsive behavior, and somatization.17 Thus, in order to deliver the best management of these patients consultations with dermatologists and psychiatrist are essential, as in the case of this patient. DA is a rare self-inflected skin condition that can affect all ages and both genders, although it is more common in young women. Understanding, recognizing, diagnosing, and managing this condition properly is vital to avoid the frustration that commonly results from DA and avoid repeating lengthy, time consuming, and expensive tests and focus on resolving the precipitating factors. Rodríguez Pichardo A, García Bravo B. Dermatitis artefacta: a review. Actas Dermosifiliogr 2013 Dec;104(10):854-866. Gupta MA, Gupta AK, Haberman HF. The self-inflicted dermatoses: a critical review. Gen Hosp Psychiatry 1987 Jan;9(1):45-52. Gattu S, Rashid RM, Khachemoune A. Self-induced skin lesions: a review of dermatitis artefacta. Cutis 2009 Nov;84(5):247-251. Cotterill JA, Millard LG. Psychocutaneous Disorders. In: Champion RH, Burton JL, Burns DA, Breathnach SM, editors. Textbook of Dermatology. 6th Edition Vol 4. Oxford: Blackwell; 1998. p. 2785-2813. Nayak S, Acharjya B, Debi B, Swain SP. Dermatitis artefacta. Indian J Psychiatry 2013 Apr;55(2):189-191. Koblenzer CS. Dermatitis artefacta. Clinical features and approaches to treatment. Am J Clin Dermatol 2000 Jan-Feb;1(1):47-55. Mariyath R, Kumar P. Dermatitis artefacta-A focal suicide. Indian J Dermatol Venerol Leprol. 2003;69(S1):73-74. Kumaresan M, Rai R, Raj A. Dermatitis artefacta. Indian Dermatol Online J 2012 May;3(2):141-143. Saez-de-Ocariz M, Orozco-Covarrubias L, Mora-Magaña I, Duran-McKinster C, Tamayo-Sanchez L, Gutierrez-Castrellon P, et al. Dermatitis artefacta in pediatric patients: experience at the national institute of pediatrics. Pediatr Dermatol 2004 May-Jun;21(3):205-211. Rogers M, Fairley M, Santhanam R. Artefactual skin disease in children and adolescents. Australas J Dermatol 2001 Nov;42(4):264-270. Barańska-Rybak W, Cubała WJ, Kozicka D, Sokołowska-Wojdyło M, Nowicki R, Roszkiewicz J. Dermatitis artefacta–a long way from the first clinical symptoms to diagnosis. Psychiatr Danub 2011 Mar;23(1):73-75. Joe EK, Li VW, Magro CM, Arndt KA, Bowers KE. Diagnostic clues to dermatitis artefacta. Cutis 1999 Apr;63(4):209-214. Koblenzer CS. Psychological Aspects of Skin Disease. In: Fitzpatrick TB, Eisen AZ, Wolf K, Freedberg IM, Austen KF, Goldsmith LA, Katz SI editor. Dermatology in General Medicine. 5th ed. New York: McGraw-Hill; 1999. p. 475-486. Sneddon I, Sneddon J. Self-inflicted injury: a follow-up study of 43 patients. Br Med J 1975 Aug;3(5982):527-530. Wojewoda K, Brenner J, Kąkol M, Naesström M, Cubała WJ, Kozicka D, et al. A cry for help, do not omit the signs. Dermatitis artefacta–psychiatric problems in dermatological diseases (a review of 5 cases). Med Sci Monit 2012 Oct;18(10):CS85-CS89. Lyell A. Cutaneous artifactual disease. A review, amplified by personal experience. J Am Acad Dermatol 1979 Nov;1(5):391-407. Ehsani AH, Toosi S, Mirshams Shahshahani M, Arbabi M, Noormohammadpour P. Psycho-cutaneous disorders: an epidemiologic study. J Eur Acad Dermatol Venereol 2009 Aug;23(8):945-947.